The only helmets here that are not DOT approved, novelty helmets come in a variety of styles and colors to suit any rider. With choices from German style, eagle style, hawk style and more, it is hard to choose just one look! And with gloss, matte, and chrome options, each style gets a few more choices thrown in to the mix. 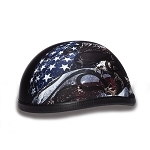 Look for graphics and designs on many of the novelty helmets, including carbon fiber designs as well as many novelty helmets for women. You won’t believe the savings you’ll find on all the novelty helmets here at The Helmet Shop!